You won’t be able to see all the stars featured in this Sky Lights, but a lot of people wonder about that fabled constellation. I recently had the privilege of traveling far enough south and was able to see the Southern Cross. Its official name is Crux. The northernmost latitude from which it can be seen is about 27°, and only then if you have a clear, unobstructed view of your southern horizon. Of course, the farther south you go, the higher it rises and the brighter it shines. 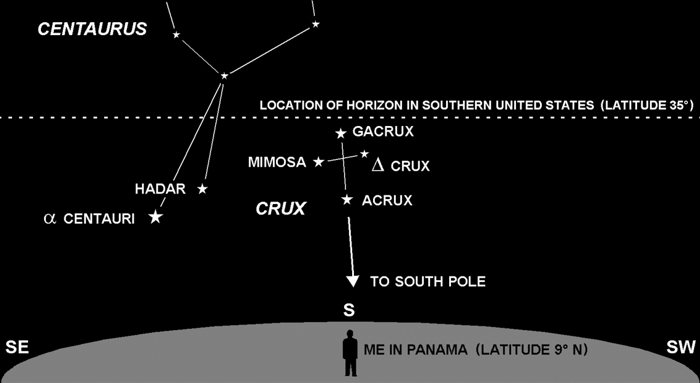 Crux is a southern hemisphere constellation not visible from the continental US. It is small, and could easily fit inside the bowl of the Big Dipper, but it is brilliant and nearly perfectly formed, pointing the way to the south celestial pole. Just east of Crux is α-Centauri, 3rd brightest star in the sky and the closest star to Earth (other than our Sun). Crux was originally part of the constellation Centaurus, the centaur (a half-man half-horse creature from classic Greek mythology). In 1679 it was isolated and renamed by French astronomer Augustine Royer.